Let’s do a quick health check. Are you showing any of these symptoms? You caught yourself looking longingly out the window and dreaming of a Hawaiian getaway at least 20 times in the last hour. You haven’t showered since…. um… wait, what day is today? You accidentally woke your child up from his nap because you were dancing and singing the Hallelujah chorus a little too loudly when he finally fell asleep. The highlight of your day is going outside the check the mailbox. A textbook case of Mommy Cabin Fever. A state characterized by anxiety, restlessness, and boredom, arising from a prolonged stay in a confined place (usually a home). Most often affects mothers who spend much of their time with small children. My toddler is dumping Cheerios all over the floor as I type. She has a tummy bug. She has recently decided tantrums are a proper form of communication. We even missed the morning play date because I was busy cleaning poop off the crib rails (as well as the sheets, the mattress, the baby, the clothes, and the board books). I was recently talking about the onslaught of Mommy Cabin Fever with my fabulous and very wise sister, Sandy. Sandy and her husband take turns. Every Sunday afternoon, he goes out for two hours alone and then she does. #2. Have regular date nights. Remember those? Like you used to do before you had kids? Me neither. It’s time we brought them back! #3. Go out with your girlfriends. Have fun! See a movie. Chat over coffee. Join a book club or Bible study. Whatever suits your fancy—just make sure you’ve got something on the calendar every month! If finding a babysitter stresses you out, I’d recommend using Care.com. There you can see sitters rated by other parents. Use code 30SAVESM and get 20% off. #4. Discover what relaxes refreshes you. For me, watching a movie may be relaxing, but it doesn’t refresh my spirit like a walk by the lake would. Think about what actually refreshes you, and do that instead! Really engage in playing with them. Embrace the season while it’s here. Go ahead and try making that fun-looking Pinterest toy—there’s no time like the present. #6. Make Quiet Time a regular part of your day. You don’t have to spend every waking moment entertaining your children. It’s not good for them or you. When they are young and do need you, make your quiet time during naps. For older kids who don’t nap, enforce an after-lunch quiet hour. Not only will it be good for your older kids to learn quiet afternoon activities like make believe or reading books in their room, it will give you the boost you’ll need to get through supper and bedtime! #7. Turn off the screens and stop working. When a quiet moment does come, don’t use up all your free time watching TV, on Facebook, or cleaning. Rest. Take time for yourself. #8. Find a non-mom-related career or hobby. Consider ways to do some work outside the home—even if for a few hours a week. Or, find a new hobby that you find relaxing: cooking, sewing, dancing, or even grown-up coloring (check out this awesome grown-up coloring book)! #9. Plan to go somewhere with the kids almost every day. Go to the library. Join a mom & tot swim class. Go grocery shopping (even if you don’t need groceries, just take the kids to look around and learn about foods). Find a local MOPS (Mothers of Preschoolers) group to connect weekly with other moms in the same life stage. #10. Create structure in your day and week. For me, it helps to have structure in my week. Every Monday, I do the laundry. Wednesdays I go to Bible study. Don’t have time to create your own planner? Here are three stunning planners you can purchase. a. ~ The exact Erin Condren planner Heather is using this year. b. 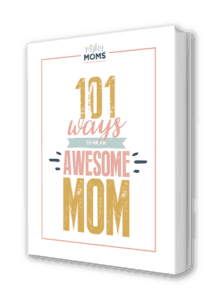 ~ MomAgenda makes long-lasting leather planners for the professional mama. c. ~ The beautiful “Mom’s Weekly Planner” designs are affordable ($15). Here’s this year’s. Maybe you’re all in a rut. It could be that all you and the kids really need is a change of pace. #12. Keep unhealthy snacks out of the house (except the chocolate). Depending on your level of discipline, it may help you to remove temptation by simply not buying unhealthy snacks in the first place. Be warned! You’ll need a replacement snack! Be sure to have some healthy things you love (like these super-yummy KIND bars) on hand for those moments when you need a tasty splurge in order to maintain your sanity. #13. Have a meal plan in place. You know those days. Those days when 5:00 rolls around, and in an oh-no-I-forgot-dinner frenzy, you open the fridge to find, to your dismay, a lone zucchini and some ketchup. Schedule some time each week or month to plan out your meals for that week or month and write your grocery list based on the plan. This helps eliminate unexpected grocery store trips, too! Heather has been using eMeals for years and is a HUGE fan. She tried last summer to go a few months without and it was an epic disaster. Click here and try eMeals for free. Science has proven it: exercise stimulates body chemicals that boost your mood and increase your energy level. What mom couldn’t benefit from that? Try exercising with a friend for some accountability. Join a softball league or dance class (three cheers for adult interaction!). Go for a run with baby using a jogging stroller (here’s one that gives great value for the price). During naptime, I like to bring in my “personal trainer,” Jillian Michaels, via this great workout DVD (You can’t beat 20-minute workouts, people). #15. Don’t neglect your spiritual health. Consider what it would look like to cultivate spiritual health. For me, it is spending time each day connecting with God by reading my Bible and praying. What might work for you? #16. Shower and get dressed each day. I’m the kind of person who feels calm when my surroundings look calm. Spend 10 minutes (all hands on deck—kids, too) before lunch and before supper straightening up the house. And, for heaven’s sake, make sure you have a pretty place to hide those plentiful and unruly toys! Cube shelves with colorful baskets work like a charm. You can find other creative ways to hide the toy clutter in plain sight in 5 Smart Ways to Organize the Toys in Your Home. #18. Have playdates with other moms & babies. Your kids get to play with other kids. You get adult interaction. It’s a win-win! Not sure where to start? Invite over that mom you’ve seen all the time at the park. Chances are she’d love to get out of the house, too. #19. Take a walk around the block or stop to see neighbor. Take advantage of good weather by heading to the park or beach. Sit out on the porch and watch the rain, then go out to jump in the puddles and look for rainbows! Snow? No problem—bundle up and build a snow fort or go sledding (a baby sled like this is great for little ones)! #20. Can’t get out? Bring the outside in. Display a vase of fresh flowers, burn a candle or diffuse some oils, open the curtains and windows. Maybe even invest in a daylight lamp to get you through those dark winter days. Change little things—or big things—around the house. Move the wall hangings to new locations. Buy a new piece of furniture or fix one up yourself. Organize your kitchen cabinets in a more efficient way. Change your music playlist or buy some new music for your collection. Eat a picnic lunch on the floor instead of at the table. Finally, why not change your computer’s desktop background to something new, while you’re at it! Having pictures around of your most precious ones can really brighten a mom’s spirit. For me, they serve as a reminder of some of the fun times we’ve had and of how much I love my husband and daughter. Make a collage of frames on an open wall or staircase, or get a beautiful canvas print of your children to hang above the couch to help you remember: motherhood really is beautiful! #23. Call (or text) the cavalry. Have some friends whom you call or text often, even if just to have a connection to the outside world. Seriously, though. Adopt a mommy mantra to repeat to yourself when the going gets tough to help you see the forest instead of just the trees. Not loving every moment of motherhood doesn’t mean I don’t love being a mom. I may not be the perfect mother, but I’m exactly the one my children need. When I want to throw myself a pity party, I try to redirect that energy into encouraging others. Try volunteering at your local women’s shelter or food pantry. Think of friends or neighbors who could use help or encouragement. Make them a meal or send a snail-mail note! I guarantee these things will make your spirit more peaceful and thankful. #26. Pick up a book. Remember those? Those rectangular things with paper pages that have words on them? I’m not talking about books about breastfeeding and vaccines and deciphering baby poop. Find something that’s just for fun. Or read something that helps you look at the big picture of life and parenting. Dream a little and cast a vision for why you are doing this mom thing in the first place. I’m bringing back my childhood by reading the Little House on the Prairie series. Heather’s testing her Sherlock Holmes skills in A Beautiful Blue Death. Christy is delving into the epic Les Miserables. Chelsea has been reliving the incredible life of Corrie Ten Boom in The Hiding Place. Lauren’s escaping into the highly-acclaimed A Spool of Blue Thread. Rachael has brushing up on her decorating skills in The Nesting Place. Hopefully some of these books on our bedside tables can give you a few starting adventures! #27. Keep it in perspective. Children are a blessing! Parenting is a gift, not a right. Even on your most burdensome days, it’s often still simply the stress of managing blessings. I’m grateful for the never-shrinking laundry mountain—my children have clothes to wear. I’m thankful that I must cook dinner again—there are little mouths to feed. I’m happy to read “The Very Hungry Caterpillar” for the eighteenth time today—I get to snuggle my little blessing while I read. All this…this… ughness is going to pass, and your poopy screaming little one will be lining up for the school bus with a minion backpack and paper-bag lunch. Can someone pass the Kleenex? We all go through periods of climbing the walls with our little ones. Especially if you’re not working outside the home. The daily routine can start to feel like a rut. Those are the remedies that have helped cure my case of Cabin Fever. What remedies have worked for you? Tell us on your favorite social media outlets and tag us at @mightymomsclub! THANK YOU!!! This could not have come on a better day. I was literally losing my mind today. I called my in laws and asked them to come over so I could leave the house. I was not going to make it until my 7pm book club! I needed to hear some of things which I was able to do with one child and now with two I just don’t seem to have my stuff together yet (8 months later). Thank you again! I’m printing this one out!